Welcome! to Astronomik's online home to Astronomers World Wide! Welcome at the manufacturer of the best astronomical filters made on planet earth! Do you remember the year 2000? In Hannover, Germany, the EXPO is opened. In Sydney, Australia, the Olympic Games are held. The Y2K bug is not as dramatic as expected, but the ''I-love-you'' virus keeps Windows users busy. The first residents head towards the ISS, while Iridium files for bankruptcy. Michael Schumacher wins the Formula One World Championships with Ferrari and in a water tower in Hamburg Eric Vesting and Gerd Neumann think about a way to produce good and affordable filters for astronomy. The filters that are available on the market at this time are either extremely expensive or grottenschlecht. The first result is a small series of UHC and RGB filters. The garage project grew within a few years to a brand that is appreciated and used worldwide not only by stargazers but also by professional astronomers. From beginners to institutions such as ESO and NASA are the filters in use and set new standards in the observation and photography. Our customers appreciate our uncompromising pursuit and dedication to never-ending improvement to meet and surpass the highest quality standards - Astronomik Filter are "Made in Germany"- and wide range of finely tuned filters to meet nearly all needs. We are now able to guarantee each filter for 10 years! Click around our website and get acquainted with our products. If you have questions or are dreaming of a product for your application, drop us an eMail. 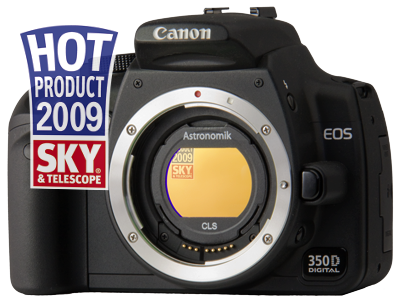 Here at Astronomik our precision German engineering and manufacturing have won us a worldwide reputation of renown and celebrity; our innovation of the EOS Clip-filter system has won us the S&T Hot Product 2009 award. Share our pride as you use and talk about your results with your own collection of Astronomik filters and products. We´re 100% sure that you will be happy with your Astronomik filter!